The new model is no simple process change, nor a mere development methodology. “Agile” changes the very core of the way your company thinks, acts and collaborates. To maintain a competitive edge in today’s evolving marketplace, businesses should refocus their strategies, putting customers at their heart and more efficiently prioritising tasks. A new operating system is required – one that empowers networks of small teams to collaborate so that they can constantly deliver value to customers, and in which leaders provide the clarity of vision to align everyone. This whole-business transformation is an absolute must for survival. Think this sounds extreme? Companies need to transform, because the market has transformed. Customers demand features they love from products that get continuously better and smarter. If customers do not receive this, there is always another product waiting for them. More than half of customers responding to a survey about performance indicate that under five seconds is the maximum acceptable response time in order for their interest to be maintained, however most experts agree the reality is closer to under three seconds (“State of the User Experience”, Limelight Networks). With product development cycles accelerating, new technologies and markets are emerging ever faster, and competitors are frequently disrupting entire industries. The way customers learn about, buy and engage with products is changing. Millennial customers demand an integrated, seamless experience regardless of channel (“Who are the Millennial shoppers? And what do they really want?”, Accenture). The world is getting more complicated. Old models cannot keep pace. Expanded collaboration can begin very close to the point where products are delivered to customers, when a company brings together agile development and development operations (DevOps), practices long known to accelerate change. The true benefit in pairing these practices and people is to pull them past information technology (IT) development into the entire culture of an organisation, creating an environment more responsive to customer demand and competitor encroachment. History sees engineering teams developing a product, and operations teams deploying the product in silo, creating an unnecessary fence between the two groups. Code is thrown back-and-forth with little collaboration. Agile and DevOps combine for vastly-improved practice. DevOps increases agile’s effectiveness through teamwork and communication, while agile catalyses DevOps to deliver on its promises of acceleration and quality. Synchronising these teams can demolish the fence, enabling easier communication and collaboration, leading to better products, faster. A global survey conducted by Coleman Parkes and CA Technologies sees 81 per cent of senior business and IT executives agree that agile practices and DevOps are critical to successful digital transformation (“Accelerating Velocity and Customer Value with Agile and DevOps”, CA Technologies). Respectively, 88 per cent and 87 per cent of companies have integrated agile practices and DevOps into one area of their business, but only 30 per cent have scaled agile practices beyond development, and 34 per cent have broadly implemented DevOps it across IT. In the words of Albert Einstein, it is of vital importance that we: “Learn from yesterday, live for today, hope for tomorrow. The important thing is not to stop questioning”. A next step is to leverage agile to transform your entire business portfolio, not just as something used to improve technical operations, product development and delivery. A growing number of businesses are benefitting from agile IT implementation and spreading this practice across marketing, finance, human resources (HR) and even executive teams (“Our growth-focused culture helped build a half-a-billion-dollar company”, BusinessZone). An agile company is one able to focus on its most important priorities and get ahead of, or quickly respond to, market shifts. This means evolving a company’s culture. “A fish rots from the head down”, as the ancient proverb says. 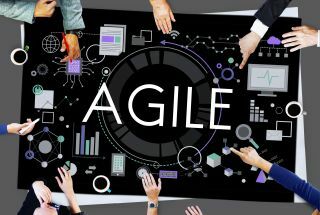 If agile implementation is delayed or fails, it is often because, though developers have embraced its methods, those in leadership positions have failed to adjust to the new mindset of collaboration over command-and-control (“10th Annual State of Agile Report”, VersionOne). Originally developed for industry, then the IT world, agile methodology is being applied to further aspects of knowledge work. Using a control and visualisation mechanism, any consistent and repeatable workflow can be optimised. Wider business functions standing to benefit from agile include HR, finance and marketing. Agility allows everyone to show up as their best self. When employees are free to adapt and take risks using agile practices, not only are they happier, but they contribute more, better meet customer needs and help their employers stay a few crucial steps ahead of the competition. Hope is on the horizon, with the vast majority (94 per cent) of today’s businesses practicing agile (“11th Annual State of Agile Report”, VersionOne).